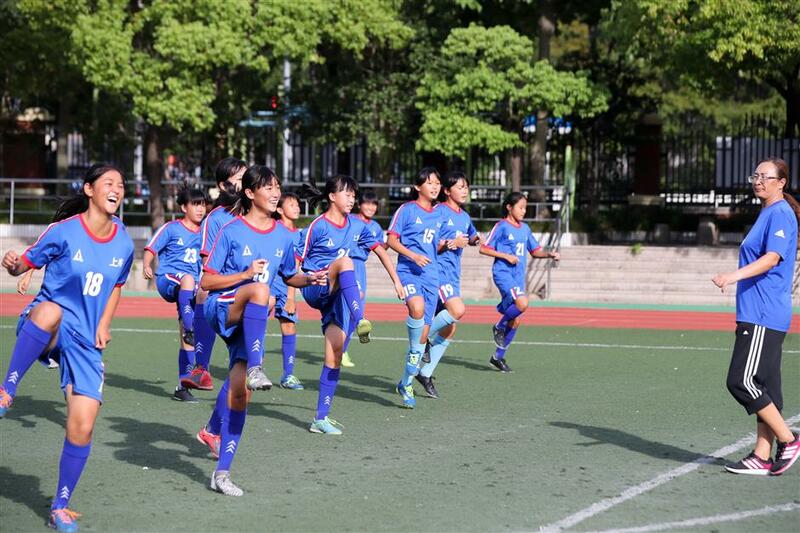 Qian Hui, who coached the 2017 Norway Cup-winning girls' football team of Shanghai Meilong Middle School, is happy that parents are now more willing to see their kids play sports. 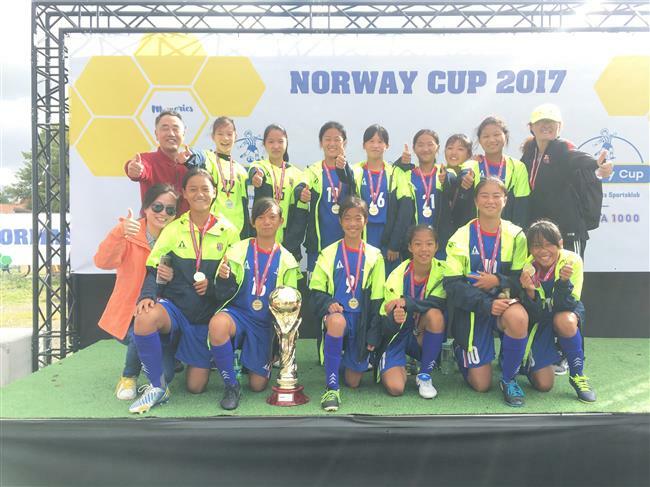 The Shanghai Meilong Middle School’s girls football team have become an overnight sensation after they won the Norway Cup 2017 by scoring 61 goals in seven matches and losing one. An online video clip showing coach Qian Hui yelling from the pitch side and asking the girls to show respect to their opponents, Blindheim IL, after they had pumped in seven goals against them in the final has became internet sensation. Norway Cup 2017 is the world’s largest football tournament for children and young people between 10 to 19 years old. Sun Yajie, a seventh grader, told Shanghai Daily that it was the first time they were participating in the tournament and were glad to return as champions. 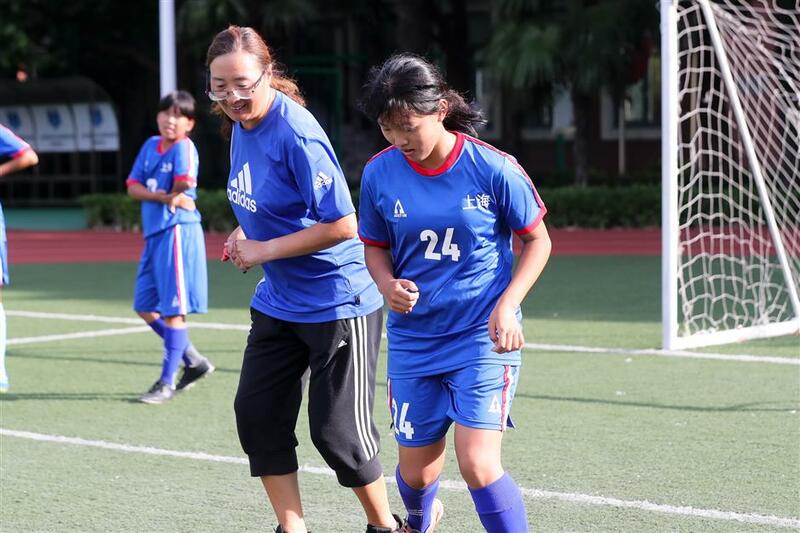 Qian Hui, who is also known as the godmother of women's football in China, trains with the players. 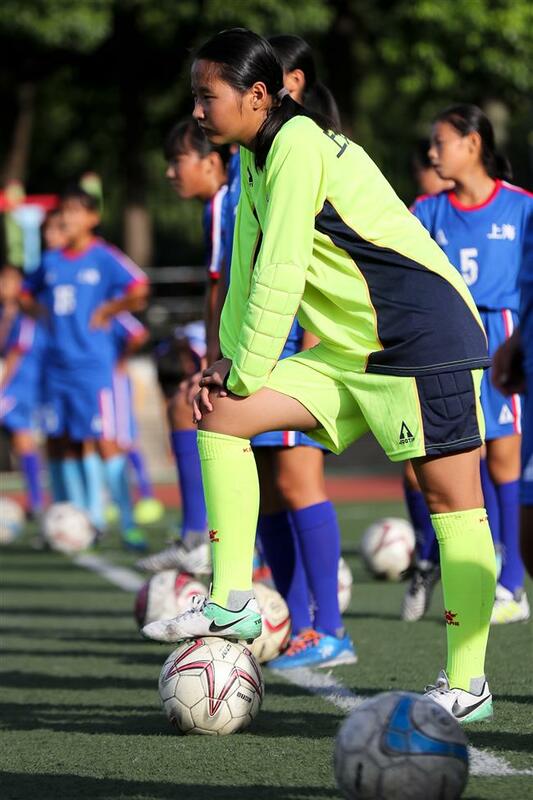 Qian, who has been training girls to play football for 24 years, pointed out that in most soccer-playing countries, children play football by themselves but girls in China only play under schools’ organization. Qian recalled the tough days when she began her career as a campus football coach in Shanghai. She used to be a professional player in Henan Province but studied at Shanghai University of Sport after ending her playing days. Her first job after graduation was as football teacher at Jinshajiang Road Primary School in Putuo District. Before her, there was no coach for girls at the school. Some of them would play with the boys. Qian had only eight girls in her team at first. So she checked out local kindergartens to select potential players. It was not easy to persuade the kindergarten runners and parents to send their children to work with her. Some kindergartens even shut the door on them. Qian admitted that most of the team members were children of migrant workers who wanted their children to attend local public schools and looked for ways to stay back in Shanghai. Most of these families lived in the suburban areas and the children had to stay at the school. It was not a boarding school and so Qian needed beds — she got the ones abandoned by universities or hotels. They lived in the gymnasium and on the playground in summer. They bathed in public bathhouses nearby. After they pulled through these difficulties, new problems cropped up. Middle schools refused to accept them. Qian had cooperated with several schools, but most of her work had ended abruptly. Only Meilong Middle School welcomed them, but it came with costs. Being a private school, the tuition fees were high — over 3,000 yuan (US$451) for each semester and it was hard for the migrant families. “I was in tears as the whole team had to be dismissed,” she said. Fortunately for her, the local sports bureau offered to pay half of their tuition fees. An excited Qian called up the parents and got the children back one by one. With the help of local authorities, Putuo District allowed children to receive regular education while playing football from primary to high school. Gifted children can now attend the Jinshajiang Road Primary School, Meilong Middle School and Caoyang No. 2 High School. Outstanding players also got the chance to get into sports school and receive professional training. They also have a dormitory, pitches and related facilities. Qian can be proud of her achievements over the past two decades. Her teams have won about 40 championships in various competitions, including five in the European Women’s Championship. Nearly 80 students play for professional teams and about 14 in the national women’s team. Qian is also glad to see that more and more parents are willing to engage their children in football, including many local families. The change comes amid the promotion of campus football by the authorities. 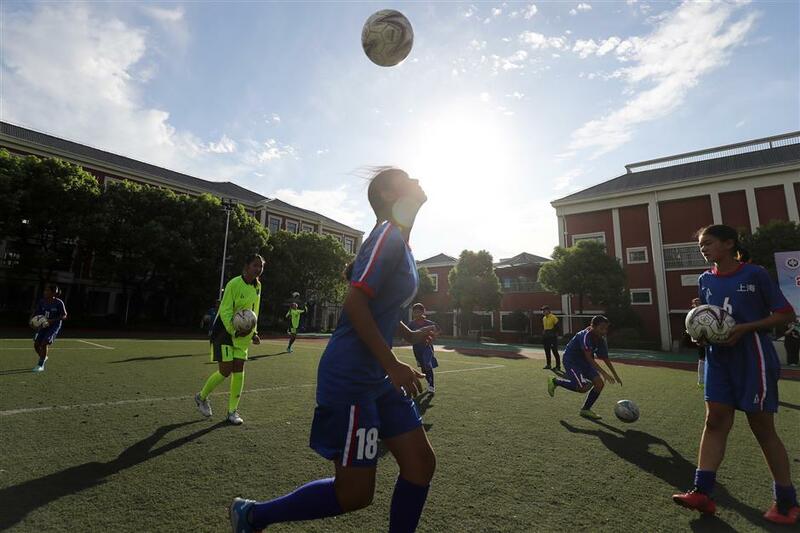 Zhang Fei, the mother of an eight grader at Meilong, said her daughter Zhang Jingwen had been playing football since she was in kindergarten. She is obviously satisfied with the result. Zhang also said she wouldn’t mind if her daughter pursued a career in football. Qian said more and more schools now have girls’ football teams, making it possible for them to develop skills through competitions. Qian said all these changes would help promote women’s football in China but she said we needed to do more to build an environment for the development of the game. “We need more kids playing the game and we also need more people being aware of the game, such as the parents,” she said. “Currently, many of the public actually know little about football and do not know how to appreciate the game. “But things are getting better and I’m confident we will make greater progress in the future,” she added.